More airlines these days are offering less services in terms of entertainment. Or they simply charge you for that live TV or Wi-Fi. And then there are some of those that don’t provide Wi-Fi (really? It’s 2012!!) or live TV. 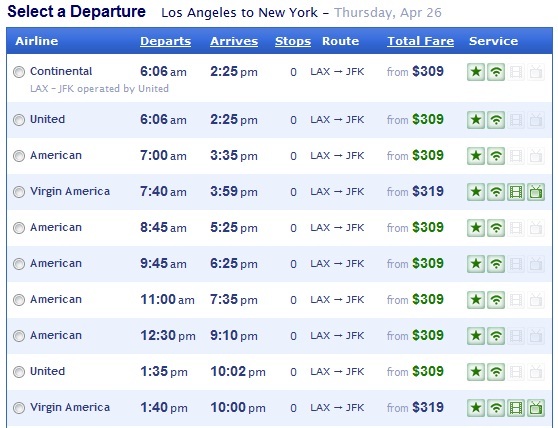 California-based online travel agency CheapAir began placing icons next to flight choices to document which flights have these in-flight entertainment amenities — and which flights don’t, that works for both domestic US and international flights. For example, searching a flight from Los Angeles to New York City lists airlines that come with live TV and/or Wi-Fi. The start next to the fares indicates that CheapAir designates that flight as its Top Pick “based on price, total travel time, on-time percentage, airline ratings, comfort and on-board amenities.” It’s all part of a CheapAir effort to make flight search more transparent.